Bala & Penllyn, situated in southern Snowdonia, Wales, is a veritable Mecca for walkers - who can enjoy the mountain experience without the crowds. The area has several lakes, deep valleys with fast flowing rivers and streams with waterfalls and spectacular rugged mountains shaped by volcanoes and glaciers – ideal terrain for mountain walking. There are a wide variety of walks, ranging from short scenic walks to strenuous ones - climbing mountains almost 3,000 feet high. Walkers are Welcome – officially recognised! To the south of Bala is the Aran mountain range with 14 summits above 2,000 ft (610 m). The Aran ridge is an excellent ridge walk with far-reaching views. To the west and south-west of Bala is the Arenig mountain range with 13 summits above 2000 ft. The Arenig area is designated as a Site of Special Scientific Interest (SSSI), the Migneint is a large moorland area which is a Designated Special Area of Conservation (SAC). 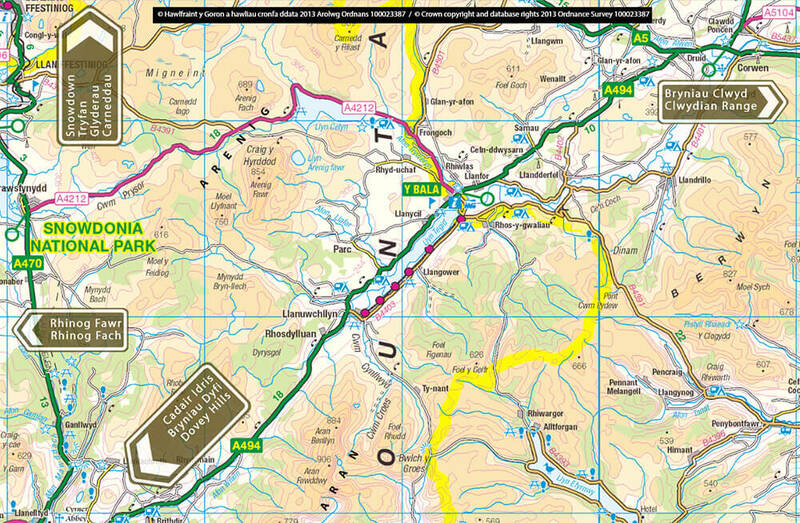 To the east and north-east of Bala is the Berwyn mountain range, including the Hirnant mountains, with 24 summits above 2,000 ft and Wales’s tallest waterfall “Pistyll Rhaeadr”. The Berwyn is a vast nature reserve and the home of many species of moorland birds. There is easy access to other parts of Snowdonia including Cader Idris, Rhinog, the Glyderau and of course Snowdon.